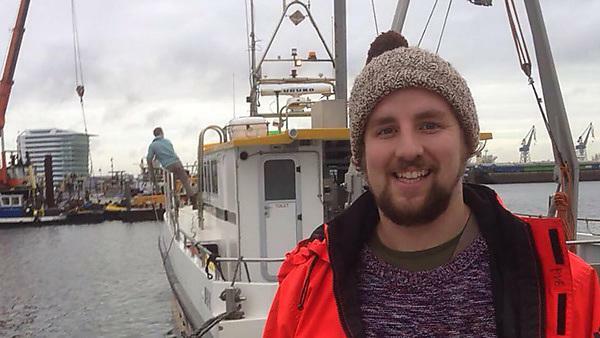 Alan Robertson now works as a Hydrographic Surveyor for Deep BV in the Netherlands after graduating from the MSc Hydrography course at Plymouth. I now work for Deep BV, which is a hydrographical and geophysical surveying company. Deep BV conducts nearshore surveys with the majority of work inside the Netherlands. 40 per cent of the Netherlands is below sea level, this means that a lot of the landscape has been engineered and waterways and canals are incredibly common. The Netherlands is also a world leader in the production of dredging aggregates, and recently there has been heavy investment within offshore wind projects in Dutch waters. The waterways must be constantly monitored, whether it is for dredging, monitoring siltation, mapping sediment movement, or surveying the cables and pipelines. Working for Deep BV is great because of the dynamic nature of the work. Each week brings something completely different and projects can be seen through from start to finish. Even though I have not officially graduated, my career path has changed completely since I started studying at Plymouth University. Following my BSc in geography from the University of Birmingham, I qualified as a beach lifeguard and surf instructor and worked seasonally in Croyde, North Devon. I am so thankful for this time out. It gave me the clarity to decide what my interests where and chose a career path accordingly. I love being outdoors, I love the ocean, and I have a firm interest in geography and the environment. The most exciting survey so far was up in Den Helder, North Holland. We were working in a rigid inflatable boat surveying the Groins which run adjacent to the beach. Our steering cable broke within the surf zone in <1.5m depth. We were rescued within the hour and dragged back to port. It was a hairy but exciting moment. The boat was repaired that evening and we completed the survey activities the following day. I really don’t think I would do anything differently. I’ve met some great people and gained some real life experience. I have always worked jobs which were relevant to my interests. I worked as a surf instructor, travelled all over the country putting up tents at festivals, worked as a fundraiser for Sustrans (Sustainable transport), successfully generating new membership to build more cycle paths, and also did voluntary work with the Royal Society for the Protection of Birds. I don’t think people should be scared to take the time to really find out what it is which drives you. I would advise anyone on the hydrography masters course not to overlook working for a company which conducts nearshore surveys. My perception whilst studying was that most students focused on working for big multinational oil and gas companies. Offshore surveying work is attractive because there is opportunity to earn big money and to work one month at sea, one month off rotations. However, offshore surveying work relies intrinsically on the price of oil per barrel. The recent slump in oil prices means that many large companies reduced their graduate intake. The Netherlands has plenty of surveying work which does not rely directly on the price of oil such as offshore wind projects and dredging work. My current line of work is a direct result of studying at Plymouth University. The hydrography masters course is held in high regard within the Industry and the modular structure meant that a vast array of subjects where covered. The 24 hour library was a first for me, and enabled me to work at times that suited me. Plymouth is a great university and a leader within the marine sector. Aside from this, a huge draw for me was the location of Plymouth itself. As a keen surfer, there is plenty of surf during winter months along the south coast of Devon and Cornwall. Plymouth is also well connected to Cornwall to search for waves along the north coast in the summer. Dartmoor is within cycling distance also, so there are plenty of ways to relax and unwind.